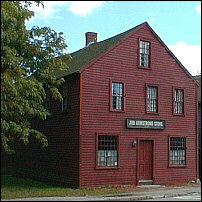 The name of the organization shall be "Glocester Heritage Society" (hereinafter referred to as "the Society"). The purpose of "the Society" is: the identifying, acquiring, holding, arranging, restoring, maintaining, opening to the public with suitable regulations; and preserving for posterity, buildings, places, tracts of land and objects of historical, educational, architectural, cultural and other similar interests of outstanding aesthetic value within the Town of Glocester and State of Rhode Island. Membership shall be open to all persons who wish to support "the Society" in its effort to achieve its purposes above stated. Membership shall be conferred upon registration and payment of annual dues. Renewal of membership shall occur January 1st of each year. The officers shall consist of a President, Vice President, Treasurer, Recording Secretary, and Corresponding Secretary. The officers shall be elected by the membership at the annual meeting of "the Society" to be held in November of each year, to a two year term, to commence on December 1st bi-annually. An officer may be removed from office for good cause shown by two-thirds affirmative vote of the membership in attendance and voting at a meeting called for that purpose. Good cause for removal may be considered for, but not limited to, absence from three consecutive meetings of the executive committee. The President shall prepare agendas for and preside at meetings and shall be ex officio member of all committees except the Nominating Committee; shall have authority to call for special meetings; shall have authority to appoint heads of committees; shall perform such other duties as pertain to the office. The Vice-President shall preside at meetings in the absence of the President; shall assist the President; and shall perform such other duties as pertain to the office. The Treasurer shall have the care and custody of all funds and securities and shall keep an account of the same in the name of Glocester Heritage Society, Inc.; shall keep accurate records of all financial transactions; shall disburse moneys in a timely fashion up to a maximum of $250.00 per invoice, or larger sums when authorized by the membership; shall deposit all moneys in the name of the Glocester Heritage Society, Inc. in such institution(s) as the membership directs; shall give a written full financial report at all meetings; and shall deliver to the in-coming treasurer all official documents as well as financial and audit reports. The Recording Secretary shall keep a true record of meetings as well as attendance; shall file and safely keep records, official documents, and such communications as may be of importance to preserve; and shall deliver to the in-coming secretary all records, reports, papers, and communications. The Corresponding Secretary shall conduct the correspondence of the Society; shall notify members of the Executive Committee members of forthcoming meetings of that body; shall notify all members of the Society of forthcoming general membership meetings; and shall notify members whose dues are in arrears. Any person who at any time serves or shall have served as an officer of "the Society", whether or not in office at the time (or the personal representative(s) of any such person), shall be indemnified by the organization against and for any and all claims and liabilities to which he/she may be or become subject by reason of service, and against and for any and all expenses necessarily incurred in conjunction with the defense or reasonable settlement of any legal or administrative proceedings which he/she is made party by reason of such service, provided that in the event of a settlement the indemnification herein shall apply only when the majority of the membership approves such settlement and reimbursement as being for the best interests of the organization. This indemnification shall not apply to matters as to which an officer shall be finally adjudged to be liable for misconduct in the performance of his/her official duties. eneral membership meetings shall be held at least four times a year, in the months of March, June, September, and a month selected by the President of the Society. Five members, including at least two officers, shall constitute a quorum. Roberts Rules of Order Newly Revised shall govern conduct of meetings. The President shall serve as chairperson of the Executive Committee and shall appoint chairpersons of other committees and may form committees as needs arise. The Executive Committee shall be composed of the elected officers and committee chairpersons. It shall have general oversight of "the Society's" activities and finances; fill vacancies arising between annual meetings; assess membership dues. Meetings may be called by the President and/or by the request of two other members of the Executive Committee upon two days written notice of the time, place and purpose of said meeting. The Archives Committee shall be responsible for the acquisition, restoration, care, cataloguing, and displaying of all artifacts owned by or on loan to "the Society"; shall be responsible for investigating and recording data of historical significance to the Town of Glocester; and shall be custodian of all "the Society's" documents and other materials such as minutes of meetings and audio/video tapes. The Building Committee shall be responsible for recommending to the President whatever improvements, repairs, and general maintenance of "the Society's" buildings and grounds are needed. The Membership Committee shall be responsible for keeping an accurate list of members and for the collection of dues and the forwarding of them to the Treasurer; and shall be responsible for the recruitment of new members. The Ways and Means Committee shall be responsible for recommending methods of acquiring funding for the Society's operations, projects, and programs. The Nominating Committee shall prepare a slate of officers for presentation to the membership at the annual meeting in November. This committee shall consist of three members, not holding office at the time, and shall be appointed by the Executive Committee at least two months before the annual meeting. Proposed amendments to the By-Laws may be presented in writing and discussed at any duly scheduled meeting of the general membership and/or Executive Committee. To be effective the proposed amendment or amendments shall be voted upon and adopted by a two-thirds affirmative vote of the general membership in attendance and voting at a meeting called for that purpose. The Glocester Heritage Society may be dissolved by a two-third affirmative vote of the attendees at a meeting. In the event that the vote of dissolution is approved, a completed form called "Articles of Dissolution for a Nonprofit Corporation" must be filed with the office of the Secretary of State of the State of Rhode Island and Providence Plantations, along with the applicable fee. Legal and proper notification of the proposed dissolution shall be publicized in the appropriate media. Those who donated or loaned any buildings and/or other real and/or personal property, places, tracts of land, moneys, other funds or assets of any kind, objects of historical, educational, architectural, cultural, or other similar interest of any value whatsoever, records, archives, intangibles, and the like shall be contacted, if possible and practical, to determine their desires for distribution thereof. Following distribution to satisfy the above desires, if possible and practical all residue of the above items shall be donated to Public Libraries within the Town of Glocester. If they should refuse to accept, said property and items shall be donated to the Town of Glocester to be used to promote the history and culture of that Town.